It was fun taking the little twin-prop plane from Halifax to St. John’s with Alan Doyle as part of the KP group. Half the people on the plane had a word with him as they shuffled down the aisle; the other half gave him a wink or a pat on the shoulder. The Rock’s favourite son was our emcee again last night and frankly he could have done the whole event on his own – his manner so easy and hilariously funny, playing lead guitar alongside Jim Cuddy, Barney Bentall, Sam Polley and Devin Cuddy, and then introducing the athletes – a great group that included Curt Harnett, Adam Van Koeverden, Jamie Korab, Mark de Jonge, Monica Hitchcock and Invictus Games hero Tyson Tulk. a man who runs up waterfalls. The crowd’s warm, attentive vibe carried through into the auction part of the evening (the week in Newfoundland that has sold so well across the country was not offered in St. John’s) and the music went on late into the night, enthusastic dancers up by the stage calling for encore after encore. We had tried a different Kitchen Party format this time in St. John’s – a smaller crowd of just 200 in a more intimate setting, with the chefs’ stations nestled amidst the jungle greenery and splashing waterfall of the Sheraton hotel’s bosky atrium, with a view of St. John’s harbour mouth and the grey Atlantic beyond. The judges’ table was set up in a sort of well at the heart of it all, an ideal setting for our Senior Judge for St. John’s, Chef Roary Macpherson of Wilds; the Chef To Go himself, Chef Bob Arniel; chef, educator, restaurateur and a two-time past champion of this event, Chef Roger Andrews; passionate locavore, team leader and blogger extraordinaire, Lori McCarthy of Cod Sounds; entrepreneur and gastronome Kim Snow of Marine Atlantic; and last year’s gold medal winner, Chef Nick Jewczyk of Fifth Ticket. As is so often the case, even when seven different palates are gathered together, we all found ourselves in complete agreement about the winner. It was a harder decision where bronze and silver were concerned, coming down to a mere half a percentage point. Interestingly – and this says a lot about the new spread of culinary talent in Newfoundland – none of our medallists was from St. John’s. 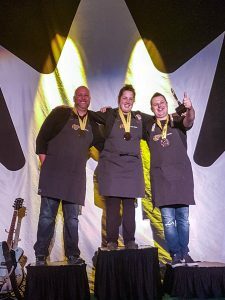 We awarded the bronze medal to Chef Kyle Puddester of Fork, in Witless Bay. He cut each guest and each judge a thick, quivering rectangular slice of a rich, weighty chicken liver parfait seasoned with shallots, ginger, garlic, cloves, cinnamon, bourbon and white wine. It was topped with a thin layer of clear jelly made from caramelized honey and apple cider vinegar, the sweet-sour combination cutting the flavour of the parfait. On top were piled all Chef’s other ingredients, a cornucopia of miniature treats. There were crunchy fragments of candied walnut (a brilliant idea) and tissue-thin slices of bitter-tart wild apple the size of a quarter. Crabapple brunoise and radish sprouts were two other components, pickled shallots and finely chopped pickled pumpkin two more. Each provided its own complementary edge of tanginess to the parfait. 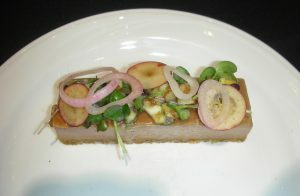 The wine Chef chose had been the inspiration for the dish, he explained – a Riesling with the crisp sharpness of crabapple – the 2017 Riesling from Gaspereau Vineyards in Nova Scotia. The silver medal went to Chef Garry Gosse of Harbour Breeze Catering in Harbour Grace. He made a sturdy croquette with a crunchy crust of hazelnut crumbs and panko filled with finely textured duck confit. The duck was moist and well seasoned and at its heart, like a runny yolk, was a surprise of bakeapple gel, a tangy condiment that also dotted the plate. 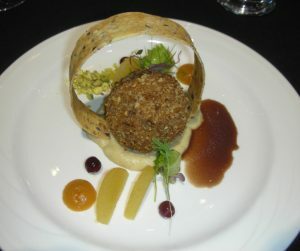 Hooping over the croquette in a most dramatic way stood a stiff ring of pistachio crisp, firm as crispbread. I couldn’t help using it to scoop up the delicious birch-smoked parsnip purée that held it in place. Fruits and herbs orchestrated the main theme of duck – little half moons of compressed crabapple; juicy purple partridge berries; fennel fronds and a celery leaf; a crumble of candied pistachio nuts. Chef spooned on a warm blueberry duck glacé as the final touch. His chosen wine reached into the dish nicely, picking up the acidity of the crabapple and the smokiness of the purée – the 2017 Reserve Pinot Noir from Pelee island winery in Ontario. 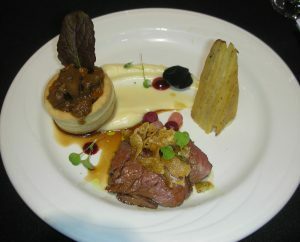 Which brings us to the gold-medal dish from Chef Katie Hayes of Bonavista Social Club in Upper Amherst Cove. Her main protein was moose, prepared two ways. At six o’clock on the plate, she had piled thin slices of seared tenderloin, cooked medium-rare and delectably tender and juicy, its subtle flavour enhanced by a thin jus. At ten o’clock stood a vol-au-vent of exceptionally lightweight, buttery puff pastry, filled with a rich stew of moose shank flecked with onion and carrot, as tasty as any stew you might remember from your garndmother’s kitchen. The third element was a triangular wedge of a technically impeccable pavé of yellow beet and potato, cooked to a perfect firm-tender texture. Multicoloured spheres proved to be a crunchy parisienne of beet, turnip and carrot, and acting as a base for the roots was a deep spread of silky parsnip purée topped with a loonie-sized disc of dark green cabbage leaf. Crispy garlic chips added crunch to the moose tenderloin; dots of partridgeberry gel and parsley oil made sure that no two forkfuls tasted the same. All the vegetables came from the restaurant’s steep, cliff-side garden, which gave them a gratifying intellectual integrity that matched their lovely flavours. Chef chose a splendid wine that was just right with the moose and a wonderful match for the partridgeberry – the fruit-forward, supremely elegant 2015 Grower’s Blend Cabernet Franc from Tawse Winery in Niagara, Ontario. Those who know her tell me that Chef Hayes has considerable experience of high-level culinary competition. We are thrilled to welcome her to Kelowna in February for the Canadian Culinary Challenge. Next stop… Victoria, B.C. Congrats to all !! Especially our lKatie Hayes from Upper Amherst Cove who is gone wild with food Congrats !! !